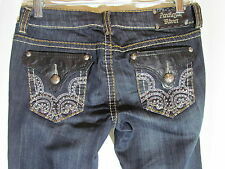 ANTIQUE RIVET FLAP POCKET BLING POCKET SKINNY JEANS. SIZE 25 x 32. 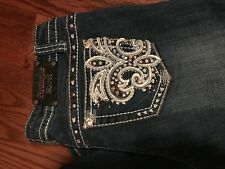 Antique Rivet women’s jeans. New with tags. Denise jean in Billboard wash. Straight leg fit. Size 27. Style: AR5408. Retail $115. Antique River jeans. Straight leg. Love these Antique Rivet Denim jeans size 26. They are a faded black denim color. There is a button, zipper and pockets on the front and back! A few man made distressed marks on the leg openings. A tad stretchy denim. 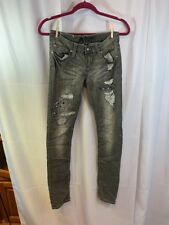 Antique Rivet Jeans Size 25 Gray Distressed Embellished Pockets Straight Leg, Faux leather accents,Good condition no flaws. Length 40". Inseam 33". Antique Rivet Skinny Jeans - Women’s size 26 These are in EXCELLENT condition! They are a darker denim with the destroyed hole look. They have white and black leather strips on both back pockets along with metal studs and brown, tan & gray stitching. Waist = 14” stretches to 15” Inseam = 32” Rise = 8” Please pay within 3 days or contact me to set up arrangements of when you plan to pay for this item. If no payment is made and no communication has been sent then I have no choice but to open a non payment case. NO INTERNATIONAL SHIPPING Items are typically sent out within 24 hours of payment received. Weekend or holiday purchases may be delayed until the post office reopens. You are buying a pair of Antique Rivet-Slam Wash Vault Denim Jeans Great Pockets Size 29 Actual W32, L32. Material 98% Cotton, 2% Spandex. I do my best to take good pictures so you know what you are getting. Distressed and embellished studs around pockets, front & back. Only worn twice. In excellent condition. INEAM 33 IN. BOOT CUT 9 IN. Bootcut Jeans 32/10-L 36x32. STYLE: bootcut. 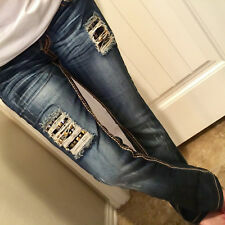 Amazing Antique Rivet jeans! These are so easy to dress up or wear casually. White on color,and 5-pocket styling. Embroidered and rhine stoned back pockets. Black jeans feature a trendy faded wash, 32" inseam, straight leg and flap pockets at rear embellished with faux leather, rhinestones and pewter studs. Made of 73% Cotton, 26% Polyester and 1% Spandex. 73% cotton; 26% polyester; 1% spandex. Back waist has logo patch. There is whiskering and distressing. Front rise: 7 ½”. Back rise: 12 ½”. Leg opening: 14”. These may be a bit darker/lighter than pictured. Nice stretch to them. 98% cotton 2% spandex. ANTIQUE RIVET Women straight leg jeans Size 27 Black Wash Denim Bling. Condition is Pre-owned. Shipped with USPS Priority Mail. Mid rise stretch (73%cotton, 26% polyester, 1% spandex) black distressed with whiskering & sanded. Leather, studded & crystal back pockets & front right pocket. Waist 27”rise 7” inseam 28”. Antique Rivet Lennox Jeans Sz 27 EUC! 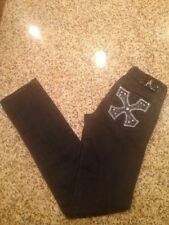 Antique Rivet Black Faded Bling Rocker Straight Slim Jeans 27 x 32L. There is one small flaw in that the black rear tag is coming away. It’s barely noticeable, please see pictures. Condition is gently Pre-owned. Shipped with USPS Priority Mail. No returns. Thank you! New never worn cargo slim pant. Jeans Pants (USED), In good used condition, with little Signs Of Wear Due To Normal Use (See Photos). Leg Opening- 7.5". Front Rise-10". Color Might Be Slightly Different Than In Photo. slight wear do to normal wear. Antique Rivet Womens Jeans Size W36 L30 Blue Denim "A"